MVP Kenny Johar was recently awarded the Microsoft MVP Award, for his contributions towards Internet Explorer. He has carved out a successful IT career by helping to make technology, more accessible to Australia’s visually impaired. Kenny was diagnosed with problems to his eyesight during the final years of high school, and had intended to follow in his father’s footsteps and become a doctor. The news that he had retinitis pigmentosa, a degenerative sight condition, came as a crushing blow. 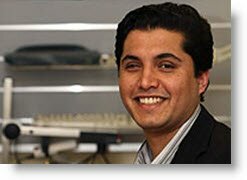 The honour means Mr Johar is among 4000 of the international IT community’s brightest stars whose technical skills and leadership have been noted by Microsoft. Mr Johar, who lives with his wife in the Melbourne suburb of Balaclava and works in the IT department of Vision Australia, said he was thrilled to be the first blind person in the world to receive the honour.